In the following overview of home-buying process, the professional Realtors of RE/MAX of Bartlesville lay out the specific steps you will encounter during your home purchase, from determining just how much home you can afford to closing the contract agreement. What Type of Home do We Want? Where Do We Want To Live? Lenders use established formulas for helping determine what price home you can afford to purchase. Depending upon the lender and the type of loan, you will be required to come up with 3 to 20 percent of the purchase price as a down payment on your new home. Lenders then apply slightly different formulas for determining your "total monthly housing costs" in order to establish your qualifications for securing a home loan. Some lenders figure in basic amounts for maintenance and utilities in addition to your Principal, Interest, Taxes and Insurance (P.I.T.I.) plus association dues, and any other fixed costs. Once you've determined how much you can afford, see our Mortgage and Amortization Calculator to help you determine the home price range that will fit into your budget. For more specific figures and details, contact a RE/MAX of Bartlesville Realtor to help prepare a "pre-qualifying" estimate for you. You may know exactly what you want in terms of the structure of your new home. Perhaps you've already chosen a single story ranch style over a two-story condominium. Or, you may be open to several options and you'll "know it when you see it." Selecting a neighborhood that is compatible with your comfort and lifestyle is the next consideration. A variety of concerns will play into your decision about which neighborhood is right for you and your family. When you've made the decision to purchase a particular property, your RE/MAX Realtor will assist you in presenting an offer to the seller. Your offer to buy involves submitting a signed real estate Contract that specifically states the terms and conditions upon which you would like to purchase the property. Your offer will generally be accompanied with a good faith deposit check for the seller. Depending upon the area in which you are located, this offer may be known as an offer to purchase, a contract of purchase, a contract of sale, an earnest money agreement, a deposit receipt, or perhaps another variation. The seller may accept your offer as presented, or employ the option to "counter" your offer with slightly different terms, price, financing, or other conditions. Once both you and the seller have agreed to the terms of purchase, you have both signed the document, and you have been notified of the seller's acceptance (usually when you receive an actual copy of the Contract), the document becomes a valid sale contract. NOTE: It may happen that you and the seller cannot reach a mutual agreement. In that case, the seller will refuse to sign your offer and no contract will be entered. At that time, your earnest check will be returned and your RE/MAX Realtor will begin to search for another home that, hopefully, the seller will accept your offer to purchase. Competition among lenders is vigorous. Your search for the best loan may include discussion with representatives for mutual savings banks, savings and loans, private lenders, Mortgage bankers, finance companies, credit untions and Mortgage loan brokers. It is important to take accurate notes when speaking with each lender's representative in order to effectively compare loan availability, interest rates, terms, loan origination fees, discount fees or points charged, appraisal fees, down payment requirements, income requirements, and other specific items that lenders may request. Your RE/MAX Realtor will introduce you to lenders who can assist you. You can also use our convenient Mortgage and Amortization Calculator to help you determine approximately what your Mortgage payment would be given different loan amounts, interest rates, down payments, and terms. Total monthly income including alimony, child support, bank retirement, interest, dividend or trust income, etc. Assets such as cash in banks, stocks, bonds, other property owned, vested interests in retirement plans, life insurance, automobiles, etc. The lender will carefully review the information provided by you in order to determine the risk in lending you money to purchase a home. At the closing or settlement, you and the seller will each have completed the conditions and met the terms pursuant to your contractual agreement and Title to the property will be conveyed to you. Following the closing, you will receive a final Settlement Statement for your records that clearly illustrates all the fees paid by you to close the Contract. Your RE/MAX Realtor will attend the closing with you and assist you with any quesitons you may have. 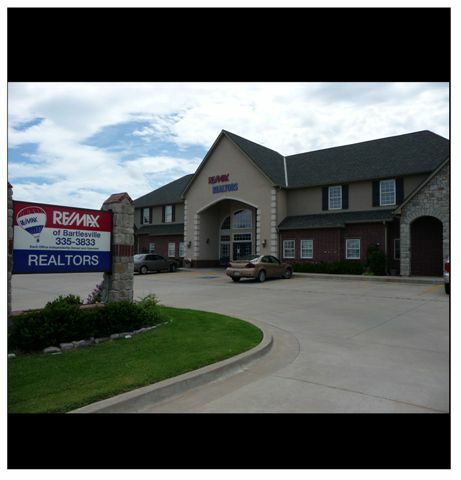 Contact a RE/MAX of Bartlesville Realtor today! Let them turn your Dreams into reality!